Roger de Clare, 3rd Earl of Hertford is the son of Richard Fitz Gilbert de Clare and Alice de Gernon. He was the brother of Gilbert de Clare, Lord of the Manor of Standon in the twelfth century. Gilbert de Clare gave the church and lands of Standon to the Knights Hospitallers who were a group of monks. 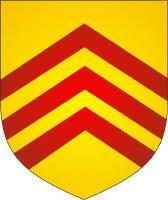 Roger de Clare succeeded to the earldom when his brother Gilbert died without issue. In 1164 he assisted with the Constitutions of Clarendon. From his munificence to the Church and his numerous acts of piety, was called the "Good Earl of Hertford". He married (ca. 1150), Maud de St. Hilary (1132-24 Dec 1193), daughter of James de St. Hilary and Aveline. In 1156 Roger received from Henry II a grant of whatever lands he could conquer in South Wales. Later that year he entered Cardigan and took the castles of Humfrey, Aberdovey, Dineir and Rhystud. Seven years later Prince Rhys and his Welsh Army attempted to win back this land. His early success resulted in a fresh English invasion. Soon after inheriting his estates Roger came into conflict with Thomas Becket, the Archbishop of Canterbury. Becket argued that some of the manors in Kent should come under his control. Roger disagreed and refused to give up this land. Becket sent a messenger to see Roger with a letter asking for a meeting. Roger responded by forcing the messenger to eat the letter. In 1164, Becket was involved in a dispute over land. Henry II ordered Becket to appear before his courts. When Becket refused, the king confiscated his property. Henry also claimed that Becket had stolen £300 from government funds when he had been Chancellor. Becket denied the charge but, so that the matter could be settled quickly, he offered to repay the money. Henry refused to accept Becket's offer and insisted that the Archbishop should stand trial. When Henry mentioned other charges, including treason, Becket decided to run away to France. Becket eventually agreed to return to England. However, as soon as he arrived on English soil, he excommunicated (expelled from the Christian Church) the Archbishop of York and other leading churchmen who had supported Henry while he was away. Henry, who was in Normandy at the time, was furious when he heard the news and supposedly shouted out: "Will no one rid me of this turbulent priest?" Four of Henry's knights, Hugh de Morville, William de Tracy, Reginald Fitz Urse, and Richard Ie Bret, who heard Henry's angry outburst decided to travel to England to see Becket. On the way to Canterbury the four knights stopped at Bletchingley Castle to see Roger of Clare. When the knights arrived at Canterbury Cathedral on 29th December 1170, they demanded that Becket pardon the men he had excommunicated. When Becket refused, they hacked him to death with their swords. Roger de Clare fathered seven children: Mabel de Clare, Richard de Clare, James de Clare, Eveline (Aveline) de Clare, Roger II de Clare, John de Clare, Henry de Clare. He died in 1173 in Oxfordshire and is buried in Eynsham Priory, Oxford, England.